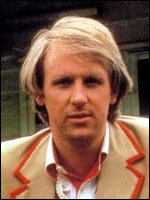 Peter Davison was born Peter Moffett on 13 April 1951 in Streatham, London, and grew up in Woking. He became interested in acting in his teens and joined the Byfleet Players amateur dramatics society while still at school, later attaining a place at the Central School of Speech and Drama . Davison graduated in 1972 and worked in repertory theatre for several years. His television debut came in three episodes of children's sci-fi series The Tomorrow People (ITV, 1973-9). Davison played a space cowboy and for his first scene was dressed in just a Harpo Marx -style curly wig and underpants. Co-starring was American actress Sandra Dickinson , whom Davison married in 1978. Davison spent 18 subsequent months working in a tax office but an acting break came with romantic period serial Love For Lydia (ITV, 1977). He starred as one of Lydia's four lovers, Tom Holland. His next period series, All Creatures Great and Small (BBC, 1978-80; 1988-90), catapulted him into the big league. Attracting almost 19 million viewers at its height, Davison became a household name as naïve junior vet Tristan Farnon. Now hot property, offers flooded in. Two successful sitcoms saw him continue to play slightly weak but likeable characters. In Holding the Fort (ITV, 1980-82) he was Russell Milburn, hapless househusband to army captain wife Penny. Sink or Swim (BBC, 1980-82) saw him as the feckless Brian Webber, regularly shown up by his more outgoing younger brother. Outside primetime, Davison hosted children's lunchtime storytelling show Once Upon a Time (ITV, 1979-82) for its first three years. A keen musician, he provided the theme tune to another children's lunchtime series, Button Moon (ITV, 1980-88), and also wrote and sang the theme to the sitcom Mixed Blessings (ITV, 1978-80). Doctor Who producer John Nathan-Turner had been Production Unit Manager on All Creatures and on his office wall was a photograph of Davison accepting a trophy in a charity cricket match. The picture prompted him to approach Davison with the idea of replacing Tom Baker as the Doctor. He debuted as the fifth Doctor, dressed in antique cricketing gear, in January 1982. Much was made of his being the youngest actor to play the part and in his more subtle moments he played the Time Lord as an old man trapped in a young man's body. This more vulnerable slant contrasted with Tom Baker 's larger-than-life style. Coupled with a move from Saturdays to new twice-weekly weekday slots, Davison helped reverse the previous year's ratings slump. With three series on air virtually simultaneously Davison was constantly on screen - he was the subject of This Is Your Life (ITV, tx. 25/3/82) aged just 31. Davison felt Doctor Who 's 20th Anniversary season was stifled by a dependency on old monsters and nostalgic flashbacks and found the programme's eternal under-funding frustrating. Former Doctor Patrick Troughton had advised him to do three years in the role, and Davison's last serial duly aired in March 1984, when the Doctor regenerated into Colin Baker . With several high profile roles already behind him the spectre of typecasting often associated with roles like Doctor Who seemed to avoid Davison. He was next seen in period serial Anna of the Five Towns (BBC, 1985), playing Henry Myers. If anything Davison was becoming slightly typecast as TV's Mr Nice Guy but playing Dr Stephen Daker in Andrew Davies ' satire A Very Peculiar Practice (BBC, 1986-88; 1992) provided a worthwhile twist on this. Here the vulnerable young trainee doctor at a University campus was an island of normality among a parade of grotesques. This pushed Davison from the family entertainment bracket into something edgier without damaging his bankability as a 'TV star', as shown by his casting as 1930s detective Campion (BBC, 1989-90). Revivals of All Creatures re-established his nice guy image but after a brief spell where work dried up in the late 1990s it was At Home With the Braithwaites (ITV, 2000-03), a drama about a family of dysfunctional lottery winners, that finally broke the mould of genial types with the distinctly flawed and unlikeable David Braithwaite. Four runs of Braithwaites established Davison as a top rank ITV drama 'name'. He has since played an out-and-out villain as a stalker in Too Good To Be True (ITV, 2003), down-on-his-luck cop Dangerous Davies in The Last Detective (ITV, 2003- ) and the curmudgeonly Dr Bill Shore in Distant Shores (ITV, 2005- ). Davison and Sandra Dickinson divorced in 1994; their daughter is actress Georgia Moffett . Davison married actress/writer Elizabeth Morton in 2003.